Recently it became abundantly clear by a certain critic of The Law of Octaves that the concepts on which the significant Law of Octaves stands, have moved me to offer a humble writing on the character of the Law of Octaves and its interval, mostly for inquiry. Not that I truly need to, this Law has been known for a very long time by mystics of nearly every era. It was perhaps first made publicly known through Pythagoras, hidden in plain sight in the biblical and associated scriptures, discussed by many mystics of old, and some of contemporary times. But one does not need to read anything to know of these Laws, that indwelling knowledge exists within the Being of Light, who one truly is, and one can be lead to this knowledge of Sevens, Threes, and so forth, without the need of writings. All knowledge is indwelling and it is, of course, the true meaning of Education. When I discovered the forums, I had known about the law of forces and law of seven, but in a way that would’ve been only perceivable to me at the time. So if it could be for me, it can be for anyone, who is able to have real education. But this critic does not know about this and is locked in a dogmatic box, as such, it is reasonable to write about the Law of Octaves, in this way. The said critic was apparently a pianist, who assumed or imagined that, all because he knows the technicality of aspects of music theory, it means he could understand this Law of Octaves. More than likely, this was owed to the usage of the word “Octave”, which of course is from the latin root which translates to ‘scale of eight” (do-re-mi-fa-sol-la-Ti-do), which is often associated with the major scale of the piano and the fact that he totally missed the point of the article by Allan (see: http://nazirene.org/spiritual_meaning_of_marriage3.htm#octave), as a result of his approach to music in relationship to his doctrines of belief on the Torah. As a result, in his rebuke, he seemed more interested in explaining about music’s relationship with the Torah, then actually assessing the main point of the Law, but that is another matter. People like him, and I mean the linear thinking types, the intellectuals who through the modern form of public education, has all but forcibly forfeited and had further usurped their essence-self and intuitive faculties, will have difficulty understanding something like the Law of Octaves in life. They have exchanged there higher faculties for rote linear thinking/conditioning via false-personalities which had their birth from such environments. This creates a sterile condition of mind, that through wrong thinking, and imbalanced connection (conditioning) to the forms that exists, where “I” is not included in their observations (all knowledge should be self knowledge), has closed up the possibilities from, again, being seen and understood. And with this barrier of dualistic thinking, i.e. “this is this and that is that” type of thinking, no greater connection to their Soul Self can even be formed, for they are already filled to the brim with the philosophies and thinking’s of our institutions of the world. Such individuals have never been taught to truly think – to engender thought which can make way for their Soul to teach them, like a current of connection. In the case of this Pianist, and what has been a stumbling block for many, is that they assume that the Law of Octaves is merely a Law of Piano and get stuck in the piano, seeing the tree for the forest. But ironically, if you have read the Article by Allan (http://americanspirituality.divinestrategery.com/#LawOfOctaves) , you would be able to quickly see, that this flaw of getting stuck in the piano, is a very working of this Law upon their thinking, where they see only the part, that the law can be presented in a piano only because the Law is present in everything, as a whole, due to their own unique organic barriers, which has yet to be overcome or straightened out. The Law of Octaves, in its actions, is immutable, inevitable, and exists even if you chose to accept it or not and the fact that you can’t recognize it, is proof of its action upon you. And this is not an insult, but a natural fundamental law’s movement upon the Laws of creation and creations natures. Not only is clearly visible in all, it can be measured and heard with ones ear via music instruments, but more specifically, string instruments. This Law is of immense significance to all who wish to really achieve anything beyond the natural limitations which are imposed upon them. It is chemistry, as it even uses it as a law of its science, the law of Octaves – it is in physics, in the color spectrum, in the ordering of the days of the week, in process of cellular structure formation — that are bodies, in their cells, are renewed/changed every 7 years, Seven Spiritual centers/major glands, etc. This sentiment of the Law is expressed in music due to the frequency of sound and vibrations relationship to the Law. Everything in life represents a specific expression of thought in vibration, and the Law of Octaves, in its essence, is a Law of vibration – and if we look above, it is more specifically, a Law on the process of vibrations change, stops, and twists, to quote G.I. Gurdjieff, in “Fragments of a Forgotten Truth,” “In order to understand the meaning of this law it is necessary to regard the universe as consisting of vibrations… These vibrations”, he continues,” develop in a regular way only for a certain time… But at a certain moment a kind of change takes place in it and the vibrations… slow down and… change their nature or direction.” So if this is the case, all aspects of life, both within us and outside of us, is subject to, inevitable points in their progression where the momentum, rate, or condition naturally regresses, and departs from what was its normal state from its beginning or its path. What this means, upon the octave movement, which start straight, will at a certain point, twist and turn out of alignment. And since all things are vibrating, thus moving, and nothing is truly still, then all succumb to the dynamics of this Law. Seekers, for instance, may start out sincere, only to become disillusioned into the idea that they have found, and are actually very far from finding. The passage of the vibration from the 7th note, Ti, into the 8th note, Do, is a passage of completion – what this means is that the last Do is the beginning of a higher octave, so that the last Do is double the vibration of the first. So the passing over from the first Do to the last, is a process of bringing completion to the Alpha Do of whatever process or condition is being moved by the Law — everything between the beginning and end is merely the striving/gradual possible fulfilling of what was initiated in the beginning – The product in the beginning being developed to reach its fulfillment. The Intervals, in this law, are the inevitable points of change in the process of all things, and it is at the point of the interval where the Law of Octaves gets its most defining and perhaps essential character. In the above, what is being described is the change in momentum, where the vibration is halved or changes in its momentum. In other words, the twisting occurs. The intervals between the steps in the octave could be thought of as gravitation points, where the movement is drawn in, and effects the movement of the next step. In other words, the step before initiates/begins the step after it, but the interval is where they interact, or are drawn together. But it is the key intervals, the third-fourth and seventh and eighth, where the twisting happens. It is, between these key intervals, why mankind, as a whole, walks the Broadway of self destruction and cannot walk through the straight gate to the inner kingdom. But this is not only applied to higher spiritual objectives/ideals in life, it is the reason why things which people do never seem to finish for the most part… why relationships fall apart, why religious movements and social organizations become their opposite, and why anything under the activity of human experience and outside of it, never goes straight, but moves off into other directions, even turning about and becoming its complete opposite. Ultimately, the enigmatic interval is the major test for all that falls under human activity. It is a point of testing, the testing of what has been developing along the process of the first steps — DO-RE-MI. As you may notice, DO-RE-MI is a triad and this triad is consistent with the Divine Pattern of Creation, which could be thought of as a law of content, i.e. everything has permeating in it the Active, Reflective, and Third Forces, while the Law of octaves relate to progress. So combining of DO-RE-MI in this way is just showing that the pattern is represented in the motions of the octave. This is why it is a Divine Pattern, which can be said to be God’s signature found in even the smallest of phenomena. DO-RE-MI is DO-ACTIVE/the initial movement, thought, desire, need… RE-REFLECTIVE/the action being reflected back on itself, how do you fulfill the desire, need, thought… MI-NEUTRALIZING/what reconciles the action with the reflection. From these one can begin to see how practically they can apply this to any new thing they do, for after every action, there is a reflected one. With this, one can begin to understand that things are not automatic before the interval of mi-fa – and there are efforts to be made, before or better said, IF, one can even get to that point – if we are considering ideals of attainment. DO-RE-MI is the forerunner efforts, which is necessary to even hope to make the path straight for the coming of help – if we are referring to trying to achieve inner development. The law of progress or Octaves defines for us the character of how all things move, no matter how great or small, there is a natural “path” by which all things MUST travel, and by which all vibration inevitably develops upon. Due to this and the forces of the Divine Pattern of Creation, it can be said; there is only ONE way to completion. Thus the Octave becomes the necessary struggle which measures your real progress. The interval between MI-FA, where discord and illusion exists, according to how this “process” acts upon our own organic nature, is ever present, again, if one accepts it or not. In life there is always something which tends to cause a “falling” of what we want. Naturally, as things start they are strong, but as they continue further, they begin to slow, stop, and even flip flop. This is similar to how people typically start something in good intentions only to have those intentions turn into its opposite, and at worst, having no awareness that this twisting has occurred. In life, a man can go on and on in this illusion of making progression and right decisions, only to have found themselves in worst sorts then they were when they even began. The scriptures call for a seeker to make their “last works greater than the first” – or, “I am the first and the last”, the acknowledgement of the completion of the Octaves. In the Thomas Gospel we read, “For this reason I say, if the owners of a house know that a thief is coming, they will be on guard before the thief arrives and will not let the thief break into their house (their domain) and steal their possessions. As for you, then, be on guard against the world. Prepare yourselves with great strength, so the robbers can’t find a way to get to you, for the trouble you expect will come. Let there be among you a person who understands.” Each person, ought to be watchful of the Law of Octaves, so they don’t suffer lose, and find their end worst than when they started out. When the law of Octaves is applied to humanity it acts upon each individual person’s nature/condition. What this means is that our organic nature creates the conditions and need for the interval. If all people were perfect, then there would be no interval, for it would have worked itself out already. But since all people are being propelled, developmentally, towards their omega of being, being divided, the law acts upon them — as the laws ask for resolution in the dynamics of their layered being. It is the organic condition, which creates the illusion, as this law works upon it — man does not see things as they are. With the example of the piano, there is no full step between the mi and fa, but yet we hear the illusion of it being full to us. In a similar manner, the whole world is a stage and or schoolhouse, but does not appear to most to be so; they do not know they are in a play, where their life is scripted before they were end born — for this too is a cause of this organic limitation. The interval makes a man think and feel he is “right, whole, developed, complete” when he is still “very wrong, very divided, very underdeveloped, and very incomplete”, even to the degree that one can destroy all that they have built, thinking they are making the right choices. In the gospel of Thomas, Yeshua says, on when the Kingdom will come, “It will not come by watching for it. It will not be said, ‘Look, here!’ or ‘Look, there!’ Rather, the Father’s kingdom is spread out upon the earth, and people don’t see it.” – and the reason why man cannot see it, is owed to the Law of Octaves acting upon them, in connection with their own organic condition. That saying, of course, referring to the reality that the seemingly concrete world we see is not at all, and what the forms of this world really are objectively are never truly seen, only a projection, which offers only a small fraction of its nature which is often ones own organic projections which they perceive as an accurate portrayal of whole reality. Natural man sees only what these laws allow ordinary. The question becomes, what can we do about it? What is needed to transcend this impasse, of the enigmatic interval, or the barrier stands before us, behooving us to face our own limitations of mind and being? In many religions the idea of being in submission to a higher source of power to make it through difficulties is often mentioned. With the interval, a force is needed which can take them to the other side – a help must come from above the state that one is in. If one was addicted to drugs and they wanted to stop, they would not be successful by going to a person afflicted with the same sickness for help. The blind cannot lead the blind and the same exists for one’s own development, if they imagine that they, existing in the illusion can somehow produce results that are not a part of that illusion, they are fooling themselves. One can’t do what is outside of their capacities at the level they are at. Help can’t come from your “organic nature”; a force above it must be there to lift it. You must meet it half way, that is to say, prepare for it by opening to the possibility at the right time to be taken pass what your organic limitation previously did not allow. What exist beyond FA is “higher” and that which is “higher” is descending to YOU or that opportunity is placed before you, one of which presents a higher life and a higher possibility of a reality that eludes your momentary perception due to the limitation imposed upon your mind. This concept of help provides that an escape or a way of growth, is always given, as every difficult upon the octave and interval is proportionate to what is possible to be handled individually, “No temptation has seized you except what is common to man. And God is faithful; he will not let you be tempted beyond what you can bear. But when you are tempted, he will also provide a way out so that you can stand up under it..” (1 Corinth 10:13) For instance, the addict must have help from something or someone who is beyond that point and help will exists for this to happen. In the case of self development, there will be others who can help you, and ultimately one’s own Soul-Self, which is ones god, if one draws nigh unto it. If one is aware of the Enneagram, they will understand, why I am suggesting “help comes from above”. The Enneagram is a symbol of Law, it shows the dynamic relationship between both the Law of Octaves which Gurdjieff called heptaparaparshinokh, and the Divine Pattern, which Gurdjieff again called, Triamazikmno. But there is more, what is also being represented in the circle, is the Law of one or The All and the Nothing, the Unity and the Segmentation, which the whole works from the point of. 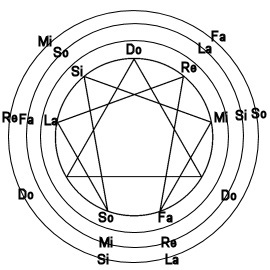 In the above symbol, you will see the Law of octaves or 7 related in the movement of the line from 1–>4–>2–>8–>5–>7–>1. While the Law of Three is represented in 3,6,9. 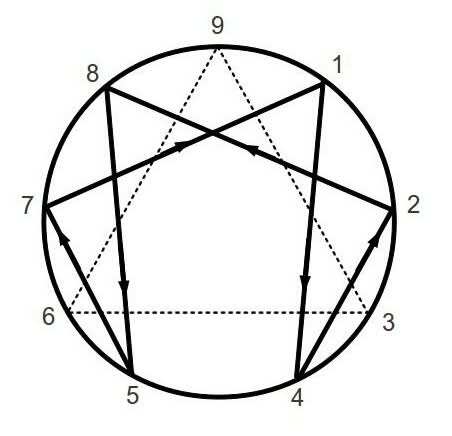 The above is a more developed version of the enneagram, in it we see multiple octaves in succession, which fill the interval for each other. If we further applied the symbol of the Octave to man and his spiritual centers, what is represented in the above is the movement of overcoming the natural energy outputs in the organic body that feeds nature. The natural laws only takes mans development to a certain point for the bodies organic needs, but they can not overcome the interval for man, as the body only supports what its vibration naturally allows. In this symbol, we see that the body has in its pattern the possibility, partially and under special conditions, to develop this energy by straightening the natural organic twists, and introduce or develop a higher expanded state of consciousness in the man. But this possibility of growth also shows the natural limits in the body, which maintains only a very limited condition of mind and being naturally — only that which provides for rudimentary biological needs. Now if you look at the relationship of the laws in that symbol, you will notice something… the points where the triangle falls, are the points where the intervals are — and each point of the triangle is taken as Do, or the beginning of a new octave. Help comes from the point of a new octave and it is taken as a third force, being a point on the triangle. The 3 and the 6, in this example, can be said to come from a transcending point in 9, where the beginning and ending of the circle is. In considering the above on help, it is important to understand that this difficulty can be overcome through one’s own efforts. That after sometime, as one works through the lower triad of the octave (DO-MI-FA), that eventually they can “build” a force, through extraneous efforts, in themselves, which can connect them to something higher more. What one builds or develops within self can be said to be “above” the limitation, having expanded beyond it. But this is a part of the process of “meeting help half way”. In the interval, there exists a pivotal moment for real development. This moment one will not know for sure until they get a taste for it through observation that comes before it. To taste this moment is to get an inner sensing, that intuitively you can feel and become conscious of. In that moment, is the moment for real change. It is only on the cusp, when you are standing between the lower (think of your organic and lower nature), how you have always been, and the higher, what it is possible for you to be, that you can move the lower onward in its progression, help will be there. So, if one is working with the octave, and they which to straighten out the octave, what they are doing is attempting to provide the semi-tones, where there are none, as Ouspensky in Fourth Way, said, “With certain kinds of effort we can produce these missing semi-tones, fill the intervals and in this way change the work of our machine. “ In the development of the Octave, the interval can only be straightened, by an octave, i.e. creating a whole or semi-tones, where they are missing. If I had a weakness to a certain addicted personality, I would need to work a great deal to maintain consciousness, in order to move it forward, at the pivotal moment when the twisting happens — the interval. But of course, forerunner efforts need to be made, so that one can be in the position to move that personality onward towards evolution and not send the whole of me into involution by its wants. In the example of religious movements that become their opposite, preventing this natural twisting, a multitude would need consciousness to straightened it. With what has been said in the above we can begin to form a much bigger picture, not just the tree of a forest, but the whole, as the Law of Octaves is something that is experienced throughout the WHOLE. With this understanding it becomes clearer why this is not a Law of Piano, but is simply one of the ways it can be illustrated. The Piano is essentially a string instrument, as its sounds/tones are created by hammers hitting the many strings within it. And while it is known commonly as a hybrid of string and percussion, it is in the strings that the tones are sourced in, which means musically, one can see and connect to this law better with string only instruments, as was demonstrated by Allan, which made me want to learn how to play the acoustic guitar. After that demonstration I searched for some knowledgeable videos on playing the guitar. I stumbled upon a video of a musician, who had a knowledge of the Law of Octaves, he suggested that the Piano abandoned a lot of its mystical nature, with the changes to its instrument (perhaps temperaments?) whereas the guitar has it preserved in its structure, the cycle of fourths and fifths, which i know nothing about. This is all hearsay, and unless I was there at that time (the construction of the piano), I can’t accurately verify such a claim, but what Allan suggested, was another matter and it is what sparked my mind, and that was, to paraphrase, that with a piano you can’t see what is going on (with the twist of the octave), but with the guitar you can see the strings, and see what is happening with the octave. I interpret that to mean, to me; With the piano one hears, with the guitar one hears and sees. So what can a piano man say of all this? Hey Ra…You did a great job of explaining The Law of Octaves!!! Thank you Ra. I have been struggling with trying to understand Law of Octaves and how it affects ones spirituality. I now have a clearer start to understanding the concept and have a direction to take my research forward. I cant thank you enough.